Have you ever been lucky enough to see a band perform and find yourself thinking; “One day I can be that annoying person that always tells the same story about seeing so-and-so playing at a local bar before they hit it big?” That is the feeling I had seeing Slave to the Day. They put on a very solid show. All original songs, with strong hooks, catchy melodies – a wonderful mixture of metal growls and powerful vocal deliveries. Every element of this group is solid. The band has a great stage presence. They know how to work a crowd and deliver a high energy show. There is this indefinable “it” factor to music, and the “it” is fully present for these guys. I would recommend their CD to any fans of bands like Sevendust, that powerfully use both melody and metal vocal techniques in songs. Slave to the Day does this very VERY well, both on their CD and while performing live. And beyond all that, they are nice guys. Thanks for hanging out and signing goodies for after the show – like the poster above! http://www.reverbnation.com/slavetotheday – Reverb page to see tour dates and listen to songs. 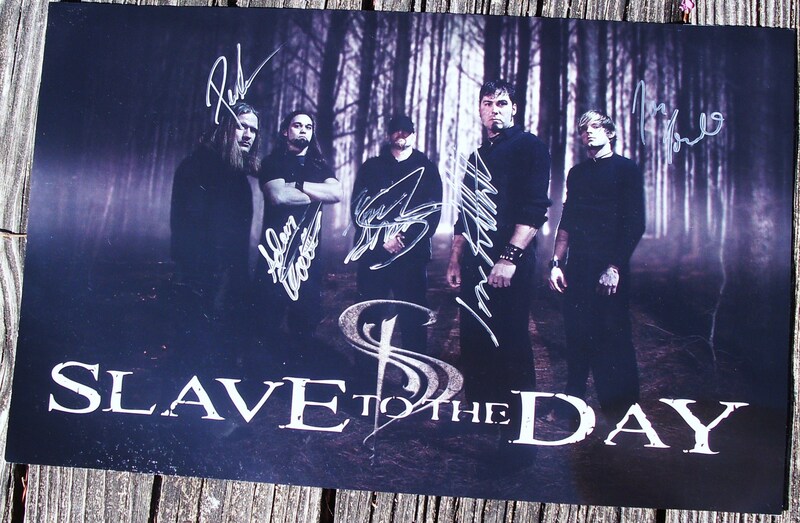 http://www.cdbaby.com/Artist/SlaveToTheDay – to support the band and buy their music! With a focus on balance, Slave To The Day pursues to musically represent the elements influential to our everyday lives. These elements include the natural, the chemical, the cultural, the social, the artistic, the adverse, the paranormal, and the future. Just as DNA is the blueprint for life, these elements are the building blocks essential to their music. Equally complex are the intertwining of melodies, strong metal riffs, ambient illusions, and natural accents. These elements can be experienced in “mans everyday grind” or they can serve as an escape. Slave To The Day calls Birmingham , Alabama their home. A city tucked in the natural foothills of the Appalachian Mountains , haunted by Indian burial grounds and old steel mills, artistic and full of culture, this city faced and still faces great adversity, and longs for a better future. These are the elements that whisper and inspire Slave To The Day. Do they speak to you? Same as always the my camera doesn’t handle audio well. But here are some videos anyway. If you want to hear a better representation of what they sound like, check out the tunes on their Reverbnation page. This entry was posted on March 28, 2011 by 850music in Posts and tagged review.